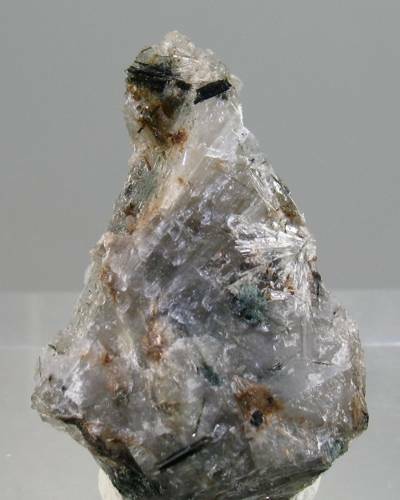 Arctite, [formula- Na2Ca4(PO4)3F] is a colorless mineral found in the Kola Peninsula northern Russia. It is a rare mineral that can be found only in the Khibiny and Lovozero massifs in the Kola Peninsula in the Northern region of Russia. It was named after the type locality as being in the Arctic regions. Common associates of arctite include aegirine, natisite, lomonosovite, umbite, and thenardite. Arctite is transparent with a vitreous luster. Its Mohs hardness is 5 and has a density of 3.11-3.13. Arctite has a perfect cleavage and a trigonal crystal system. It appears as a colorless, transparent mineral, with a vitreous luster. It exhibits a pearly luster on the perfect cleavages. Density: 3.13 g/cm3 (Measured) and 3.19 g/cm3 (Calculated). Arctite occurs in the late stage pneumatolytic mineral in pegmatites veinlets in a differentiated alkalic massif. 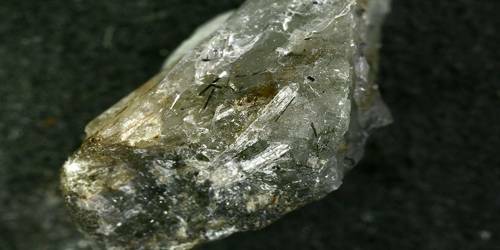 It is associated with such minerals as natrosilite, vuonnemite, zirsinalite, lomonosovite, natisite, rasvumite, villiaumite, aegirine, thenardite, umbite, paraumbite, wadeite, and kostylevite.